“You put these on, and it's always clear." A team of engineers from the University of Utah led by professor Carlos Mastrangelo wants you to say “goodbye” to your bifocals or the need to ever put on reading glasses. The team developed a pair of smart glasses that let a person with flawed vision focus on what they are seeing, be it far away or close up. “Most people who get reading glasses have to put them on and take them off all the time,” Mastrangelo told Phys.org. “You don’t have to do that anymore. You put these on, and it’s always clear.” The details of the project were published in the journal Optics Express. The adaptive lenses are made of glycerin, a thick, colorless liquid, and enclosed in flexible, rubber-like membranes on both sides. The membrane at the back side connects to three mechanical actuators that push the membrane back and forth like a transparent piston. 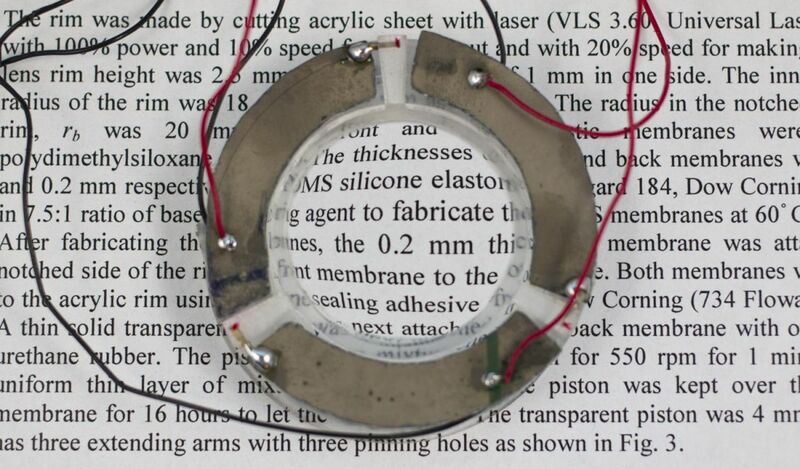 This mechanism changes the curvature of the liquid lens to adjust the focal length between the lens and the eye. This adjustment from one object to another takes just 14 milliseconds and compensates for the loss of focus usually associated with aging eyes. “The focal length of the glasses depends on the shape of the lens, so to change the optical power, we actually have to change the membrane shape,” Mastrangelo explained. All a user needs to do is enter their eyeglass prescription into an app one time, and the glasses calibrate the lenses automatically via Bluetooth. For the prototype, the lenses are housed in special eyeglass frames that the team invented, with battery-powered electronics controlling the actuators. Currently, they are working on a sleeker, lighter design, which they hope could be made available in the next few years. With an estimated 14 million people in the United States alone dealing with vision problems, the potential impact is huge.